Eversat announces that its LightAway satellite suitcase has been certified by Eutelsat. 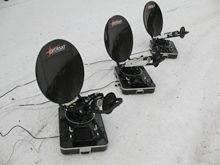 The company says the LightAway mobile antenna system is the first sub-1m mobile system ever certified by Eutelsat. All tests have been conducted by Eutelsat on the Orange’s test bench of “La Turbie” in South-East of France. All the LightAway range has been certified from 5W up to 200W. The certificate can be found on Eversat’s website www.eversat.eu as well as Eutelsat’s site under Earth Segment, Eutelsat Approved Equipment.